The usage of rifampicin, isonoazid, pyrazinamide and ethambuthol to treat tuberculosis (Tb) leads to hepatotoxicity which affects patient’s body weight and nutritional status. Numerous studies have shown propolis to act as a hepatoprotector. This study aimed to clinically evaluate the ability of propolis to protect the liver from the toxic effects of anti tuberculosis drug (ATD) and its impact on body weight and nutritional status changes of patients with pulmonary Tb. Randomized clinical controlled trial, involving 50 subjects of lung Tb patients divided into three groups: control (P0), propolis 1 supplementation (P1) and propolis 2 supplementation (P2); each subject received intervention for 6 months. Biomarkers of liver toxicity; SGPT, SGOT, BT, SOD and GSH were measured three times and body weight and nutritional status were assessed weekly during treatment. Measurement of liver toxicity biomarkers showed control groups experienced high liver oxidative damage during the intensive treatment stage as characterized by bilirubin exceeding normal values. In contrast, the supplementation propolis groups showed no liver oxidative damage as indicated by normal bilirubin concentrations. P2 group showed excellent hepatoprotective activity as showed by the lowest bilirubin, the greatest decrease of SGPT and the best antioxidant status of GSH and SOD enzymes. This group also showed body weight and nutritional status increased from the beginning of the intervention, while the other group decreased first. Pursuant to all indicators, propolis 2 supplementation demonstrates liver protection from toxic effects of OAT and prevents decreased body weight and nutritional status of pulmonary Tb patients. 1. Mahani, Sulaeman A, Anwar F, Damanik MRM, Hardinsyah, Ploeger A. 2018. Determination of Indonwsian native stingless bee propolis as complementary nutraceutical candidate of antituberculosis drug. Int J Pharm Pharm Sci 10 (4): 15-21 2. Mahani, Sulaeman A, Anwar F, Damanik MRM, Hardinsyah, Ploeger. 2018. Efficacy of Propolis Supplementation to Accelerate Healing Process and Body Weight Recovery of Pulmonary Tuberculosis Patients. J Gizi dan Pangan. ISNAD SULAEMAN, Ahmad , MAHANI, M , HARDINSYAH, HARDINSYAH , DARMA, E , MUBAROKAH, S. R. , NURJANAH, N . "Hepatoprotective Activity of Indonesian Stingless Bee Propolis Against Toxicity of Anti-tuberculosis Drug on Pulmonary Tb Patients". 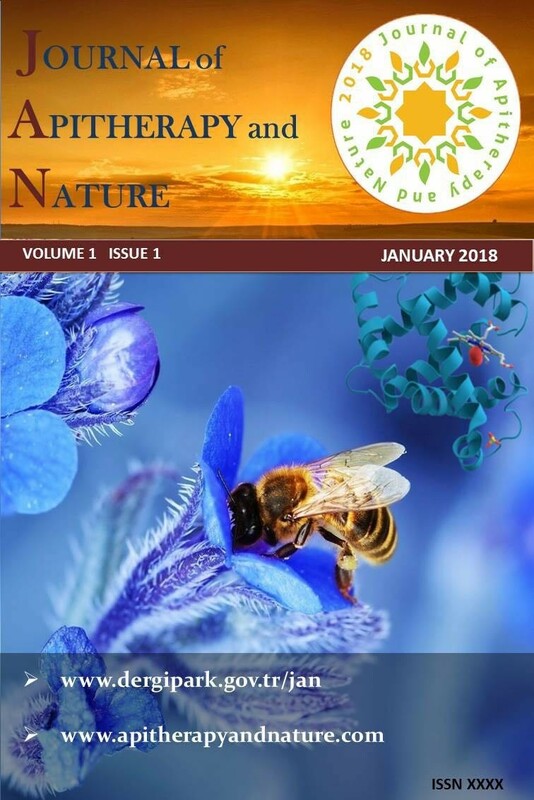 Journal of Apitherapy and Nature 1 / 3 (December 2018): 10-10.